Citrus, once a mainstay of winter desserts, will be sadly diminished this season due to the freeze in California that destroyed a huge portion of the nation’s citrus crop. I made a visit to the grocery to catch some of what remained before produce bins start emptying and prices start escalating. (Who would have imagined an orange becoming a rare and elusive thing?) I had looked forward to baking with citrus as a tart and colorful contrast to the chocolate-and-cream-heavy concoctions that cold weather favors, but instead this post will be a little lament for all the oranges and lemons we won’t see to brighten the last months of winter, or refresh and tickle our tastebuds for the rest of the year. Meyer lemons, those sweet droplets of sunshine, with their pearl-smooth skin and subtle, intoxicating perfume – whenever I smell Meyer lemons I think of irises poking through the snow, of life surging back into the landscape after the white of winter. Fiercely coveted even in the best of seasons, now I’m even gladder I got my hands on some of these beauties. A collection of ruby red grapefruit, blood oranges, and tangerines – spanning the spectrum from tart to sweet. I remembered a recipe in Emily Luchetti’s A Passion for Desserts that combined a lemon mousse with a citrus compote and I knew that was how I wanted to celebrate this sunny collection spilled across my kitchen table. 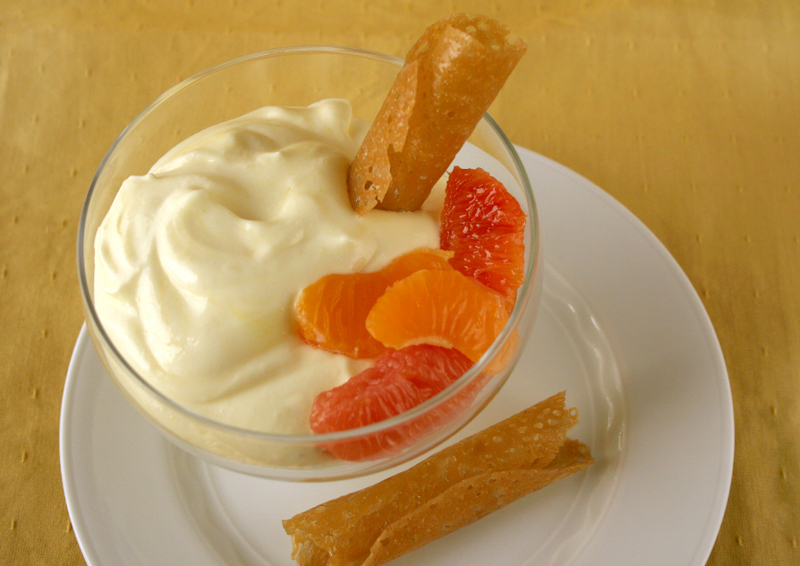 Unabashedly simple and straightforward, it lets the essence of the fruit speak for itself: a clean, vibrant lemon mousse paired with a mix of the grapefruit, oranges, and tangerines, brushed with a hint of vanilla and crowned with a crispy cigarette curl of a tuile. The vibrant pinks and reds of the fruit citrus against the soft yellow of the lemon make this the cheeriest, sunniest bowl of dessert you’ll find in the dark winter months. The silver lining to the freeze that destroyed so much citrus? (Besides a greater appreciation for the ephemerality of nature’s bounty and the unpredictability of nature herself). The freezing weather is actually good for many stone fruits, which develop best when they have a certain number of "chill hours" (As my gardening boyfriend explains, it’s like the equivalent of getting a really good, restful night’s sleep). So come the end of this summer we should be looking forward to a gorgeous crop of cherries, peaches, nectarines and plums. I guess maybe the saying should be, when life doesn’t hand you lemons, see what else you’ve got in your pantry! Strain the curd into another bowl, cover with a piece of plastic wrap placed directly on the surface of the curd, and refrigerate until cold, about one hour. Whip the cream into soft peaks. Fold gently into the curd. Refrigerate until you are ready to serve. This will keep for about a day. To make the vanilla snaps: Preheat the oven to 350 degrees. Line three baking sheets with parchment paper or Silpats. Put the butter, brown sugar, and corn syrup in a medium saucepan. Place over medium heat and let the butter melt, stirring to combine with the other ingredients. When the butter is fully melted, remove from the heat and stir in the flour and vanilla to combine. Drop the batter by teaspoonfuls onto the baking sheets, spacing them about 2 1/2 inches apart (cookies will spread). It is probably best to fill and bake one sheet at a time as you will have to work with the cookies when the come out of the oven and you don’t want one sheet to burn while you are working on the other. Bake the cookies until they are spread thin, bubbling, and golden, about 8 to 10 minutes. They should not look fully solid. Remove them from the oven and let them sit for about 30 seconds. They need to firm up slightly so you are able to slide a metal spatula beneath them and move them, but if you wait too long they will get too hard and will no longer be pliable. Working with one cookie at a time, slide one cookie off the sheet and wrap it around the handle of a wooden spoon to form a curled shape, then place the cookie on a plate to cool. If the cookies have cooled too much and will not curl without cracking, you can place the cookies back in the oven for a minute to warm them back up. Repeat with the rest of the batter. 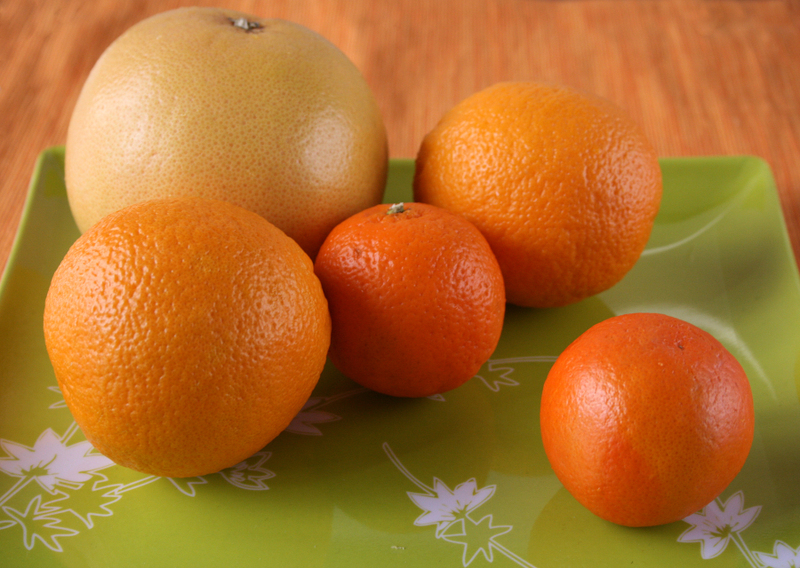 To make the compote: Using a sharp knife, cut the rinds off the grapefruit, oranges, and tangerines. Working over a bowl to catch and juices, separate the segments from the membrane with a paring knife. Place the segments in the same bowl. Cut the vanilla bean in half lengthwise and scrape out the seeds. Place the seeds into the bowl with fruit. Taste the juice. If it is too tart, you can add some sugar to taste. Refrigerate the mixture until you are ready to serve. To finish, place some of the citrus segments in a bowl. Spoon some of the lemon mousse on top, and garnish with a couple of vanilla snaps. Serve immediately. « I'm in Edible East Bay! A woman after my own heart! Splendid! I crave citrus from the moment I wake up until I dream…!Every component of this recipe is gorgeous. Oh, does that lemon mousse ever look fantastic. 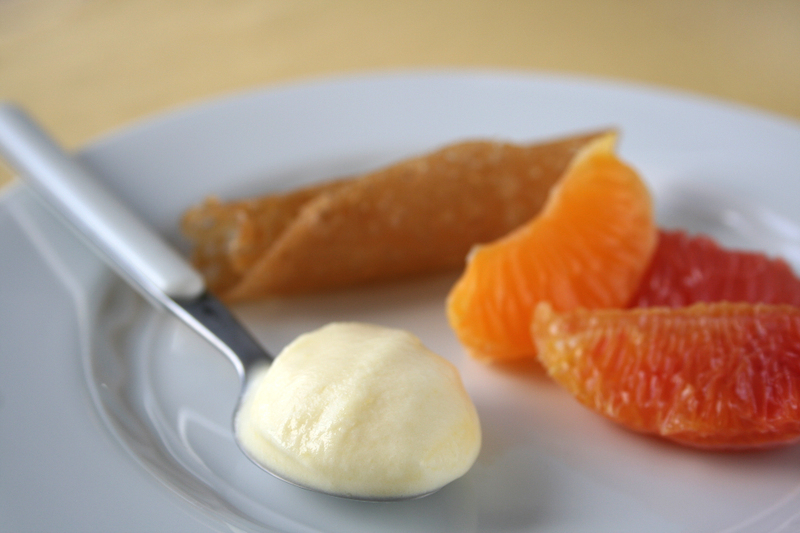 There’s nothing like the brightness of citrus mixed the silkiness of egg yolks and cream. What a wonderful composition! The mousse looks so creamy but I can just imagine that citrusy flavor that cuts and balances the richness.Yummy! Oh this is lovely and full of Vitamin C! You just cannot go wrong here! Hey that looks delicious! I have a bit of a thing for citrus too. A question too if I may! How do I tell the difference between a common lemon and a meyer lemon? I’m a great, great fan of citrus and what a joy it was to find these beautiful recipes – you bet I’ll be trying them. I will sadly miss these so much as well. I’ve not seen them here on the East Coast before this year, and they have been a great source of inspiration. I will be so sorry to see them in short supply next year. I love citrus too and always look forward to a cool juicy orange in the winter time. Love that recipe you posted. You’ve done an awesome job of photographing everything. Have a great day! Yes, citrus prices are insane…too bad since this looks wonderful, people will want to make it. Yum! I love anyhting citrus and the caramel snaps look really good. Thank you! There is something so upflifting about citrus! Thanks! I think lemon curd is one of the best things in the world – and by extension, this mousse! It’s a really nicely composed dessert – it’s why I like Emily Luchetti’s cookbooks so much! Thanks! It’s definitely a maximum payoff for minimum effort type dessert! Meyer lemons are a specific species created by crossing a regular lemon with a mandarin orange – it’s sweeter and more subtle in taste, and smells different too! 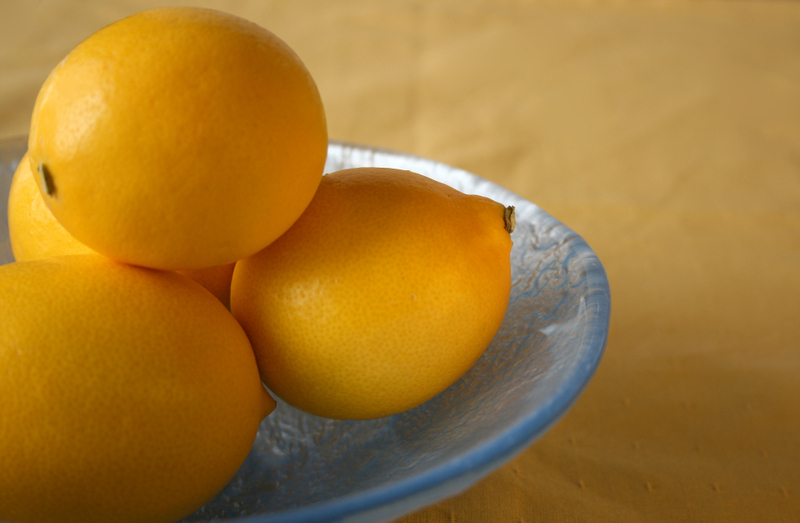 Meyer lemons look smoother-skinned than regular lemons, but they should always be labelled separately in stores, because they cost more! If you find some nice citrus, I hope you enjoy this recipe! It is a shame the meyers are so hard to find because they are so fun to use, like you said! Glad you liked the post! I like a bowl of oranges brightening up the day! Hopefully you can nab a few before they become criminally expensive – guess we’ll have to wait to next year! Thanks! The snaps were a nice crispy complement to the mousse! Thank you! I’m glad you liked the photos! I am looking for a good recipe for a lemon chiffon cake. I’ve got some fresh meyer lemons coming in December, and I was hoping to use them for my Christmas day dessert. I just came from my friend Alanna’s where she mentioned you. I’m sure glad I did. This is a splendid recipe, and I have more citrus– including gorgeous Meyer lemons from the La Jolla farmers’ market– than I know what to do with. Thanks! How much time would it approximately take ? The entire recipe should not take more than a couple hours to finish – this includes allowing time for the mousse and cookies to cool and assembly. Actual cooking time is fairly minimal.